It seems absurd to finish in Florida if you’re travelling west to east across the US. The best way to crown an American odyssey is by spending a few days in New York. There’s so much to do here and so much to see, but here are just a few suggestions of how to visit the Apple. There are four classics you’re supposed to eat when in New York: cheesecake, hot dogs, bagels and pizza. Many places will claim to sell the best or the most authentic, and even the city’s residents won’t agree on the definitive article. Nevertheless . . . We had a fantastic selection of authentic bagels at Barney Greengrass on Amsterdam Avenue (parallel to Broadway): wonderfully fresh and stuffed with filling. Eileen’s Special Cheesecake on Cleveland Place (opposite Petrosino Square) is a long-established bakery selling airily light cheesecakes with a good, thick biscuit base. It’s necessary to eat about three of these to ‘get the taste’. 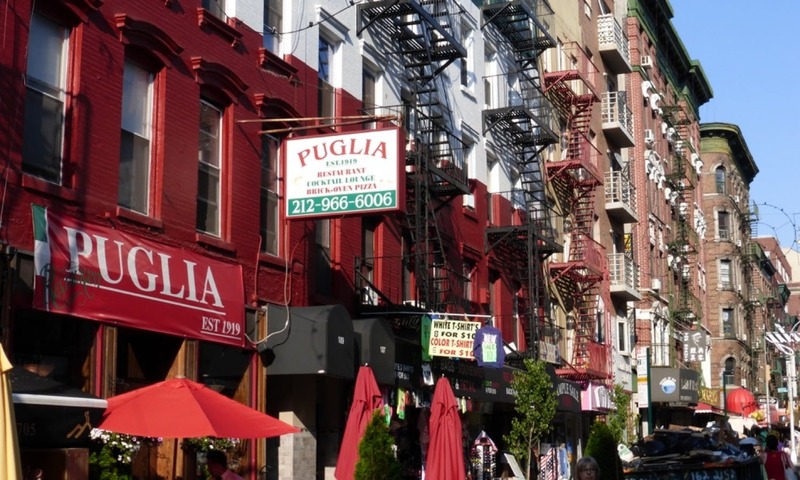 For pizza, you might want to head for Little Italy, where you can sit at one of the many restaurants or buy a slice in the street and wander among the crowds. To be honest, the pizza wasn’t as good as you’d find in Naples, or even in Italy, but it’s the tradition that counts. The smells in this district will make you want to eat even more, which is good and natural. As for hot dogs, you’ll find stands all over Manhattan, especially the touristy areas. I had dogs at Ground Zero and in the financial district but wasn’t especially impressed with either. They tasted a bit old and uninteresting. I’d had better dogs at gas stations while crossing the country. Manhattan is bigger than you think if you plan to walk, and it’s much easier to take the subway if you’re short of time. However, New York is a lot like London in this respect: you discover all kinds of things when you walk. Take time to stroll around the financial district to look at Wall Street, the neo-classical buildings and the busy millionaires. Head over to Greenwich Village and walk along quiet tree-lined streets where you might meet models shopping in the up-market thrift stores and chatting over a (skinny) latte or Prosecco at Bar Pitti. 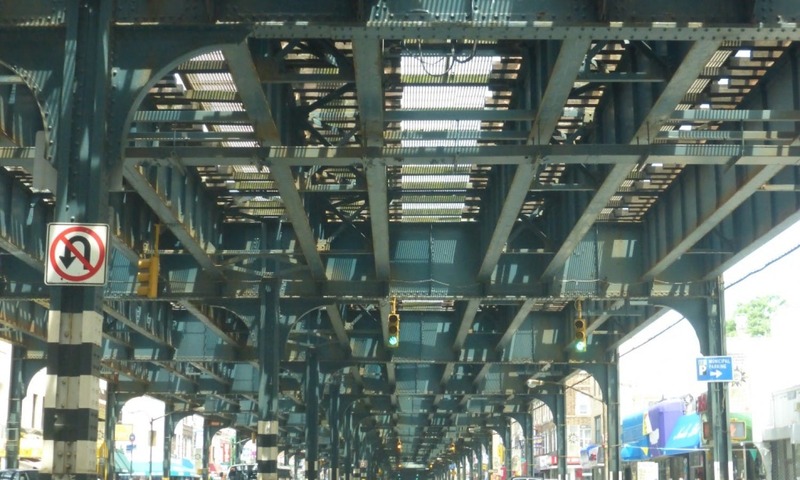 In the fashion district, walk among shops and beautiful people beneath the tangled abstracts of fire-escape steel. It’s also worth spending a few moments (not longer!) 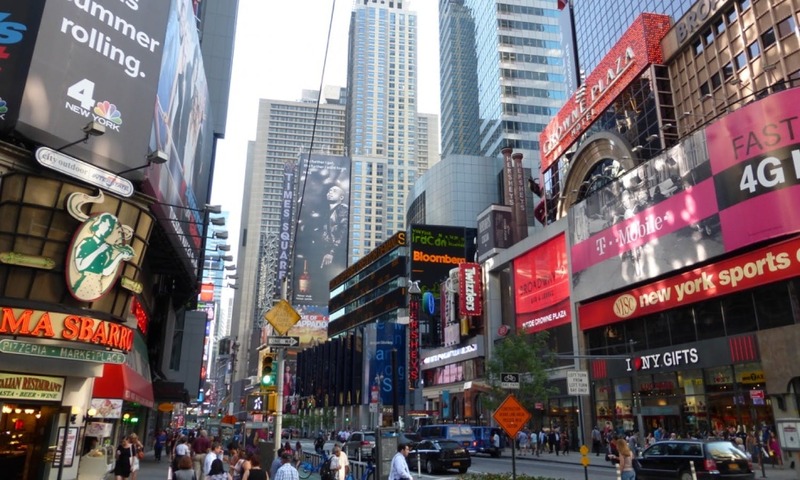 in the maelstrom of Times Square, which foams with tourists at all hours and gives the impression that you’re standing at the center of the world. For a bit of peace and quiet, you could head into Central Park to watch the joggers and cyclists go round and round. Here, it’s possible to forget you’re in a massive city as you sit by a lake under the trees or simply sunbathe. Nor is this the only park in Manhattan. Try City Hall Park, Columbus Park, Battery Park or Bryant Park to experience trees and skyscrapers together. It’s also worth taking some time to wander among the exclusive buildings of Park Avenue. Sunday morning is a good time to see the rich people going out to church or taking their little dogs for a walk. Of course, New York is all about the skyscrapers and there are plenty of great places to see them. 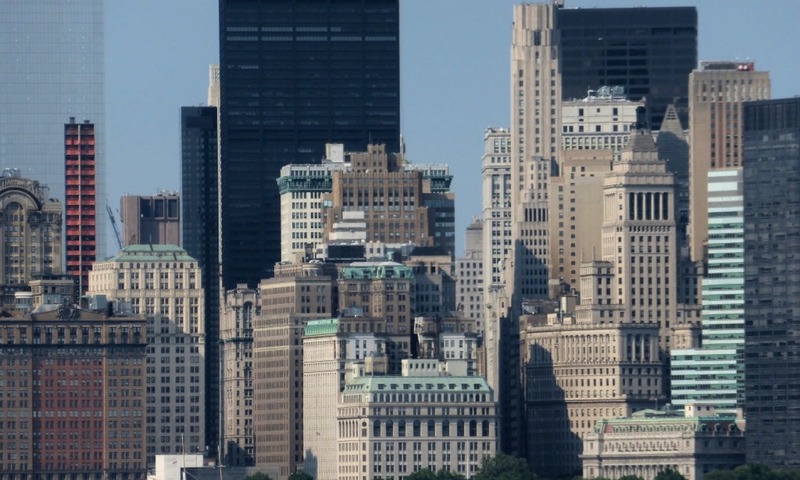 Walk around the financial district to look up at forests of stone, or take the (free) Staten Island Ferry out past the Statue of Liberty to get a fantastic view of Manhattan from water level. Brooklyn is another good place to look over the river or along the bridge at the cluster of buildings. Naturally, you’ll also get great views from famous observation decks at One World Trade Centre or the Empire State Building. There’s just so much to do in New York. You can go to the Museum of Modern Art (MoMA), or the Metropolitan Museum of Art. You can visit the Statue of Liberty and Liberty Island. You can ascend the Empire State Building. 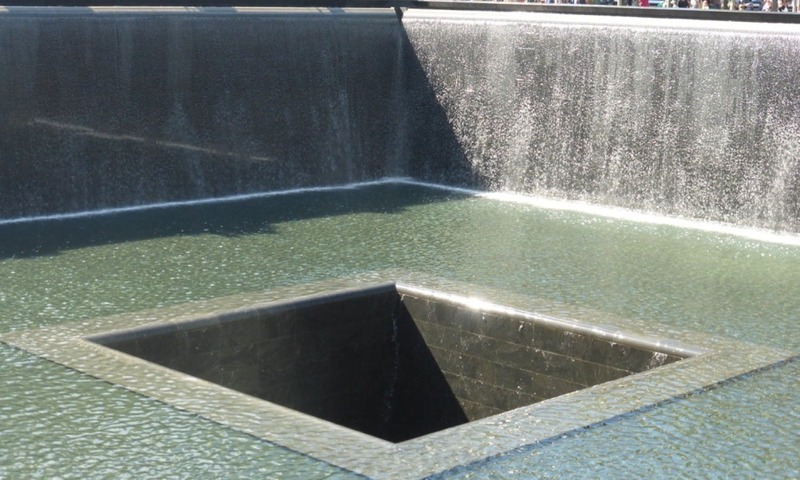 One of the most popular activities is the observation deck at One World Trade, and it’s here that you can also visit the poignant 9/11 Memorial and museum. The amazing ‘footprint’ cascade pools, the gardens and the museum provide a thoughtful morning or afternoon for anyone interested in twenty-first-century history. There’s more to New York than Manhattan. Using the subway and local buses, you’ll be able to travel further to places such as Brooklyn, Queens, the Bronx (for the zoo) and Harlem for an entirely different taste of the city. Head further south and you’ll be able to visit the beach resorts of Coney Island with its Lido Park, and the wild stretch of Rockaway Beach. Just a day in Brooklyn will reveal how many races and nationalities call New York home. In some places, you might feel like you’re in St Petersburg rather than America, as you explore delis where very person and sign speaks Russian.